What a fun challenge for today!! I got the Paper Studio "Eye Candy White Floral" dp on sale ($5 sheets for $1 at my local Hobby Lobby Saturday and just knew I had to use it for this card. My SU Pocketfull of Posies set was perfect. 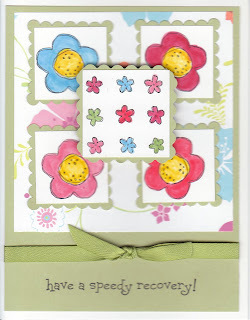 I used my Cuttlebug for the smaller scallop squares and my scallop scissors for the larger square which was adhered to the card with dimensionals. The straight squares were punched with my CM punch. The sentiment is one from Stamping Bella and fit just perfectly on the bottom. The ribbon is the new poly-twill from SU. Thank you for viewing my card .. it was a fun project to make. So cute, Linda! Very bright and fun! Thanks for playing the challenge!